A district judge in Londonderry has warned professional street beggars are taking advantage of the "generous and good nature of the local people in this community". Barney McElholm made the comments on Monday when sentencing Florica Crina Ispas from Romania. The 30 year old was jailed for two months for stealing a bottle of vodka. Judge McElholm said he believed she was part of a group who flew into Northern Ireland every six weeks. He said he did not believe she was a genuine indigent street beggar, as she had claimed following her arrest. Instead, he said he believed the defendant was "a member of a professional gang of street beggars who could afford to fly into and out of Northern Ireland every six weeks, on a shift basis, to beg." Judge McElholm said: "I don't believe a single word of what she has said and I am going to take a tough line in such cases in future." 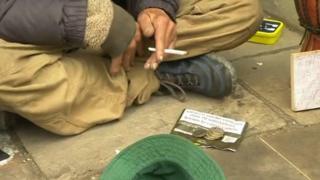 He went on: "I know what help is offered to genuine homeless people. They have been offered accommodation, they have been advised as to what benefits they may be entitled to and if they are truly indigent they would receive offers of support. "They are simply a professional group coming here to street beg and to take advantage of the generous and good nature of the local people in this community." Image caption Judge Barney McElholm told Londonderry Magistrates' Court he would "take a tough line in such cases in future"
Judge McElholm said he had met police and Derry's City Centre Initiative recently to discuss the issue of street begging. PSNI Chief Inspector Johnny Hunter said street begging was among a number of issues discussed by civic stakeholders at that meeting. "Issues such as public alcohol consumption and begging are dealt with on a daily basis in co-operation with our partners," he said. "Where those people we find on the street are vulnerable and in need of help, we will work with our partner agencies to keep them safe." He said local officers also worked closely with colleagues in the Modern Slavery Human Trafficking Unit. "Where there is evidence of exploitation or of other offences we will take the necessary appropriate action," he said. Ch Insp Hunter said street begging "is dealt with in a sensitive and proactive manner by police and the appropriate agencies."